Pop icons, sports organizations, festival impresarios, athletes and celebrities have been using their reach and influence to raise money for social good for more than five decades. Today’s programs go much deeper than check writing to include lobbying and hands-on solutions to collective challenges. Example: Bono’s ONE Campaign doesn’t just want to feed the hungry and treat disease — it’s working to end extreme poverty and prevent diseases by advocating and lobbying for the world’s most underserved communities. Leveraging the influence and platform of Bono, one of the world’s best-known music figures, it has generated more than $37.5 billion in funding for health initiatives in the fight against AIDS, malaria and tuberculosis. 1953: Boston Red Sox become first Major League Baseball team to have an official charity, the Jimmy Fund, which supports the fight against cancer at Boston’s Dana-Farber Cancer Institute. 1954: The PGA Foundation is created. 1957: Houston Livestock Show & Rodeo finds its purpose. The event’s origins go back to 1931 but it was in 1957 that the event granted its first college scholarship to a local high schooler. Raising funds for scholarships is now embedded in everything about the iconic event that draws some two million attendees each year. 1973: The National Football League launches the first league-wide foundation in professional sports, NFL Charities. The New York Yankees create the New York Yankee Foundation, the first team foundation in Major League Baseball. 1978: Minnesota Vikings create Vikings Children’s Fund, the first team foundation in the National Football League. 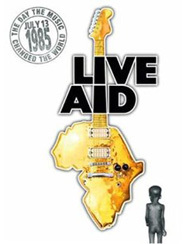 1985: Live Aid, a dual-venue benefit concert and an ongoing music-based fundraising initiative, was staged to raise funds for relief of the ongoing Ethiopian famine. 1986: Vancouver Canucks create the Canucks For Kids Fund, the first National Hockey League team to launch a foundation. 1990: Burning Man — the festival that offers a functioning utopian counterpoint to capitalism’s commodified existence — relocates to the Black Rock Desert, which enabled the transition from an event to a cultural movement. “Burners” are required to “leave no trace”; survive in extreme conditions without being able to buy or sell anything; and be an active participant in the experience by making art, volunteering, sharing skills needed by the community, and more. People leave Burning Man knowing how to live greener, understanding the benefits of diversity, inclusivity and creativity, and more. 1998: The NHL and NHLPA (NHL Players Association) partner to create Hockey fights cancer initiative. 1999: Baseball Tomorrow Fund is created as a joint initiative between MLB and MLBPA (MLB Players Association). 2006: Futbol Club Barcelona + UNICEF. Rather than selling its jersey to a commercial partner, Barcelona FC pays UNICEF £1.5 million/year for the right to put the nonprofit’s name on its shirts. The initial five-year deal began with the 2006-07 jersey and is still going strong, smaller UNICEF branding to make way for traditional kit sponsorship. The partnership between the club and UNICEF quickly evolved beyond check writing and today involves collaboration with Barca sponsors and foundations of its sponsors, players and player foundations, and partners not otherwise connected to the Barcelona FC such as the Bill and Melinda Gates Foundation. 2008: Hublot + UEFA’s Euro 2008. Using Signage for Good. Hublot became first luxury brand to sponsor football. But rather than use football to build awareness of its then little-known brand, Hublot used football to build awareness of its values. The watch company gave all of its signage to a nonprofit working to stomp racism out of the sport. As people discovered what Hublot had done, they learned more about the brand and its values, and Hublot sales grew. 2012: Global Citizens Festival Debuts. Marrying tech, pop culture and activism, the festival does not sell tickets. Instead, people earn their way in by taking a series of actions to effect change in areas such as health, education and gender equality. In between sets by A-list musicians, philanthropists and world leaders take to the stage to announce commitments to ending extreme poverty. Current: Today, almost every pro team within every major sport has a separate foundation. Most teams also have adopted CSR programs. Such activities typically include athlete volunteerism, educational initiatives, philanthropic/charitable donations, community development, community initiatives, fan appreciation, health-related initiatives, and community-based environmental programs. Most leagues and sanctioning bodies also have separate charitable arms and like the pro teams, also undertake socially positive activities out of their CSR unit. Major League Soccer has MLS Works. UEFA has UEFA Foundation. The National Basketball Association has NBA Cares. The NFL and NBA partner with the United Way and Read to Achieve, respectively. Many major events and festivals have nonprofit arms (think Newport Jazz Festival, Bonnaroo and New Orleans Jazz & Heritage Festival). And the Global Citizens Festival model introduced in 2012 whereby fans are offered the opportunity earn a ticket through activism has inspired other festivals to leverage rewards for citizen engagement including AfroPunk and Essence Festival. Finally, there are now thousands of athletes, musicians and entertainers with their own foundations. Some fund the work of other nonprofits but many also set up social good programs of their own.